"I didn't like sight or the feeling of families being separated it's a problem that's gone on for many years, too many administrations," he said. Mr. Trump later told reporters that his daughter Ivanka and first lady Melania Trump both felt strongly about images of young children separated from their families at the border, saying "anybody with heart would feel strongly about it." "You're going to have a lot of happy people," the president remarked as he signed the order. He noted that the administration would still be working with Congress to find a legislative fix to the immigration problem. 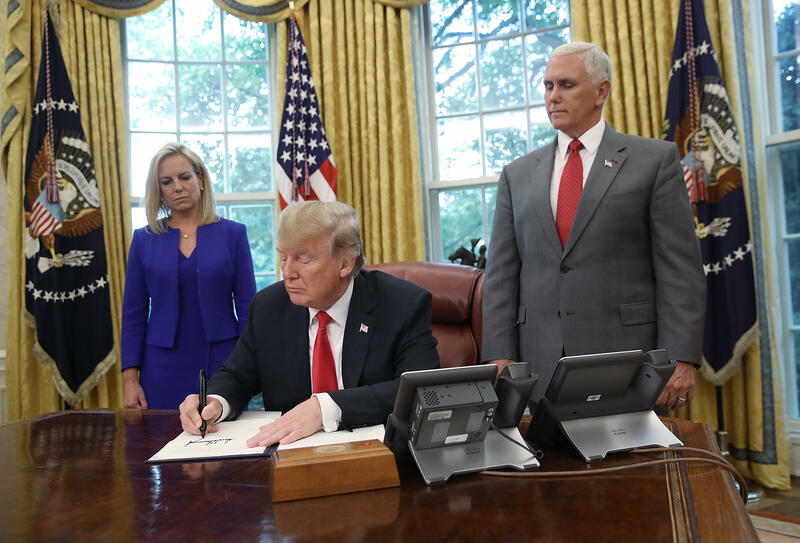 The order notes, "It is unfortunate that Congress's failure to act and court orders have put the Administration in the position of separating alien families to effectively enforce the law." The action comes after Mr. Trump met with House Republicans working on immigration legislation and trade policies. CBS News' Ed O'Keefe reports that the president's decision caught members of Congress off guard. At least two senior aides say GOP leadership had no formal notice from the White House that he planned an executive action. As for the reason why the president decided to reverse course on the policy -- "The pressure is everywhere," one senior GOP aide tells O'Keefe. "The TV is pressure. Bill O'Reilly said this is awful." O'Reilly — a friend of the president and someone Mr. Trump used to watch regularly on Fox News -- has tweeted his concerns about the policy in recent days. The senior aide also said that the public comments by senior Republicans like Sen. Orrin Hatch, R-Utah, -- usually a reliable Trump ally -- also likely played a role. Hatch and 12 other GOP senators -- including John McCain, R-Arizona, and Lamar Alexander, R-Tennessee, -- co-signed a letter on Tuesday to the Justice Department asking that the administration pause the separation of families until Congress addresses the issue.